This is my second post on World Relief and serving refugees. To read the first post click here. After our group helped set up two apartments for arriving refugee families in May, Cason & I kept feeling tugged back to World Relief to do more. We both have a passion for the international community, and this finally seemed like the perfect place for us to be serving here in Nashville. We are involved in church and serving the church community (leading small groups, Cason is a deacon, etc), but it was way past time to start reaching out to those not in the church. So we went through the volunteer application process and helped with a few little things through the summer. When fall rolled around, our church was doing another “Great Day of Service” and again our class signed up to help World Relief. It was going to be apartment set-ups again, until something changed at the last minute. 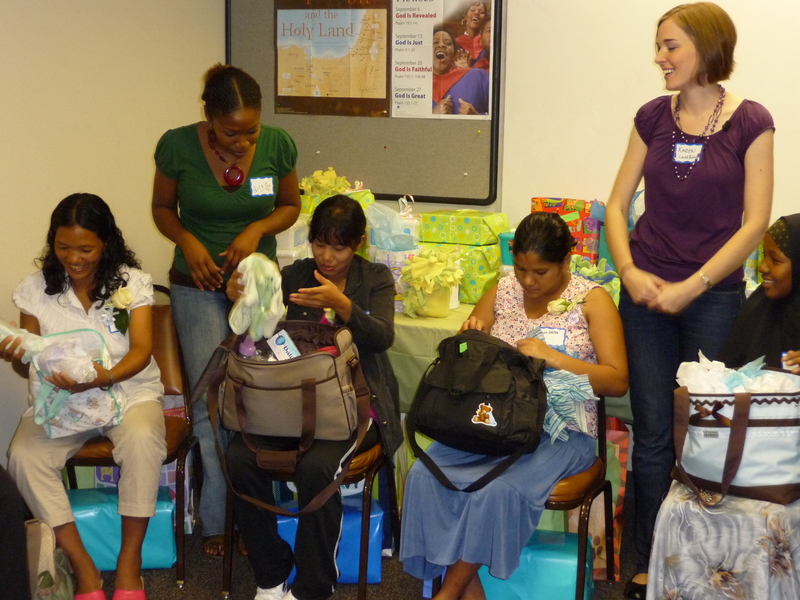 With one week to go we changed courses completely and were led to host a baby shower for 5 pregnant refugee women (1 had actually just had their baby)! These families come to the US with virtually nothing. Most of the time they have one suitcase to bring to start their lives over. These people, and World Relief, are always in such great need of help and donations. They accept all household items, especially furniture, kitchen supplies, etc. World Relief helps them get an apartment here, helps them adjust to life, and find employment. But they are only able to give them $425 per person, one time only. A family of four comes and only gets $1700 one time and that goes to pay for their deposits, rent, utilities, everything. That money does not last long. How long would $1700 cover your family of four? Can you imagine welcoming a baby in to this world and literally all you have is 2 outfits, 2 bottles, and a carseat that the hospital gave you? For the Somali woman who had delivered the week prior, that is all they had. The other women expecting babies soon had nothing. The whole experience turned in to such a God thing. In one week flat our little group gathered car seats, cribs, pack and plays, strollers, bottles, outfits, diapers galore, wipes, formula, you name it. Everything times 5. Each woman went home with a car load! It was amazing how it all came together! Only God could have orchestrated that. They generally don’t have their own transportation or are sharing one car amongst 6+ intergenerational family members. And so, one of the most meaningful parts of it all for me was picking them up and taking them home at the end. One friend & I went to the apartment complex where the Bhutanese & 2 Burmese women lived. I personally drove Dhan, the Bhutanese woman. It was an eye opening experience to drive into an apartment complex that I had personally previously labeled as “ghetto” and to realize that pretty much everyone in there was actually a refugee. It was like a punch to the gut. There were kids out playing with each other. The people were so friendly and helpful as we tried to track down our ladies. And worse yet, we used to live in an apartment complex right next to it, and even still our house is only a few miles away. These amazingly resilient people are living literally in my backyard and there is so much we can do, and should be doing, to help them. For those of you in the Nashville area, we have learned in the last many months that much of that corridor down Nolensville Road that many people label unsafe and the ghetto, is actually made up of these wonderful refugee people. People just trying to make a living and provide a safe new life for their families. They just need some help to get on their feet. I will write another post with more on World Relief later. This entry was posted in refugees, Serving and tagged refugees, serve, world relief by Karen Barnes. Bookmark the permalink. Wow!! What an amazing ministry to not only these women but the rest of their family.